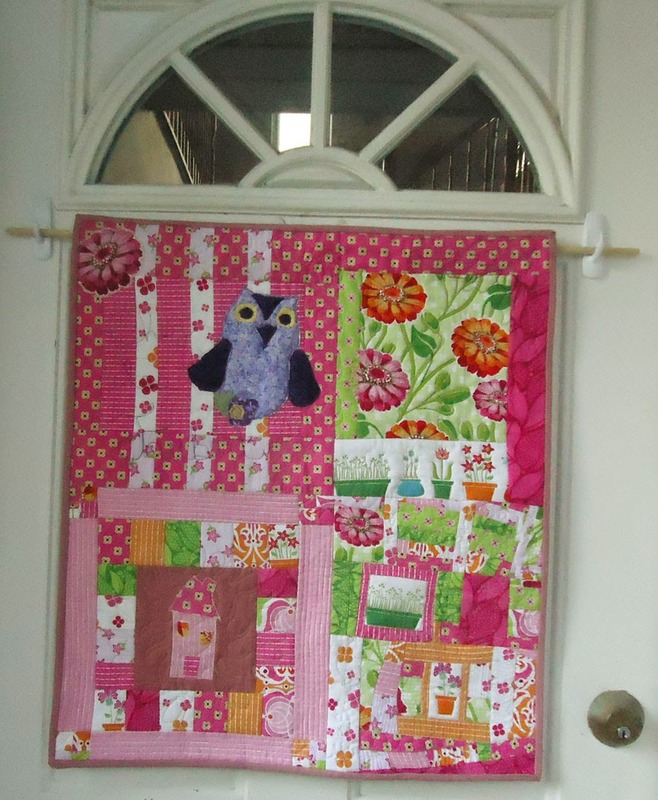 Last winter I started a spring door hanging at a retreat (it was very cold and I was very tired of winter). I had a lot of fun putting it together, probably because I did it purely by instinct. I added strips here and there, cut them up and sewed them back on. The colours were totally spring - pinks both bright and soft, greens, orange, small and large floral. Most of the fabrics may have come from the same collection. Let's just say that it wasn't for the faint of heart. appliqué technique I learned last year in Kathy Wylie's workshop. I didn't do too badly but it was only once I finished it that I remembered the trick she has taught us for making circles (the trick is essentially to make a yoyo and appliqué it). I'm afraid I wasn't keen enough to pull it apart. 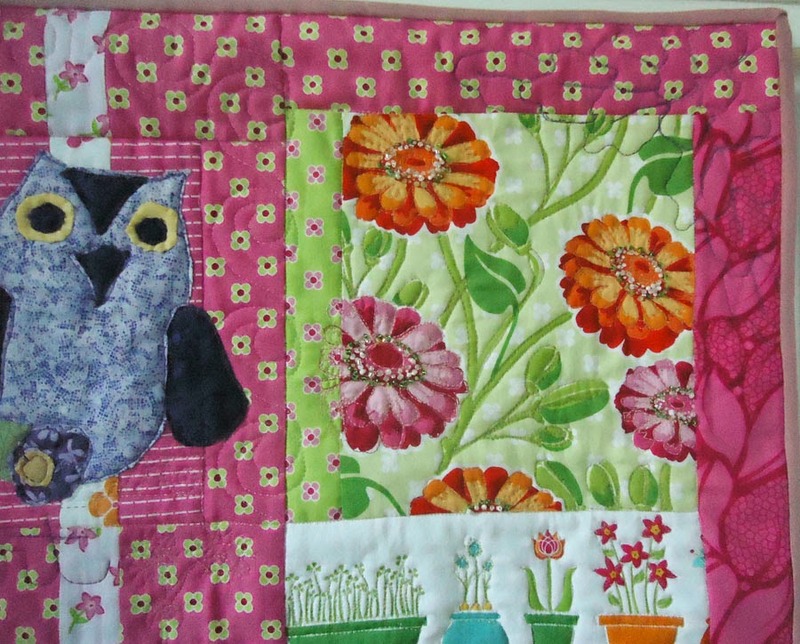 I had an awesome time free motion quilting (FMQ) this project. Since I'm presently following Cindy Needham's Design it, Quilt it: Free-Form Techniques course on Craftsy, I wanted to practice some of those techniques. 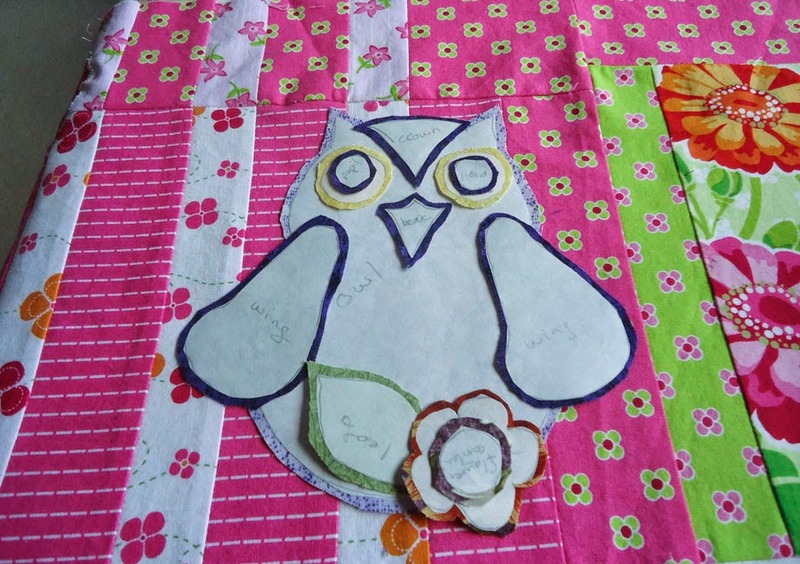 The first thing I did was to use a few quilting templates within the quilt. This photo shows one of the templates I used. It's got a heart in the middle (which is on the house...our home); the second layer looks like a sun and surrounds the home; and finally the outside of the template are feathers. Since I find following lines easier then making designs free style, this suits me well. 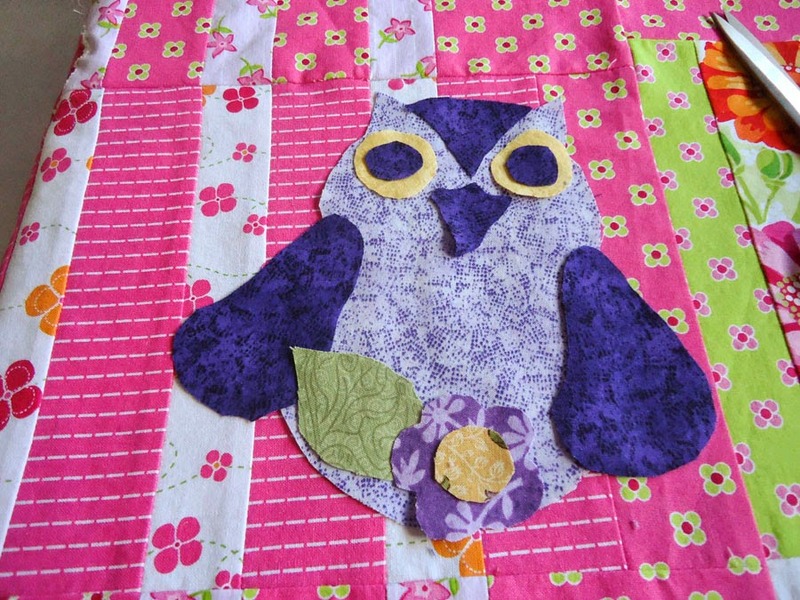 On the right top corner I used a corner template of a flower and quilted it in bright purple. 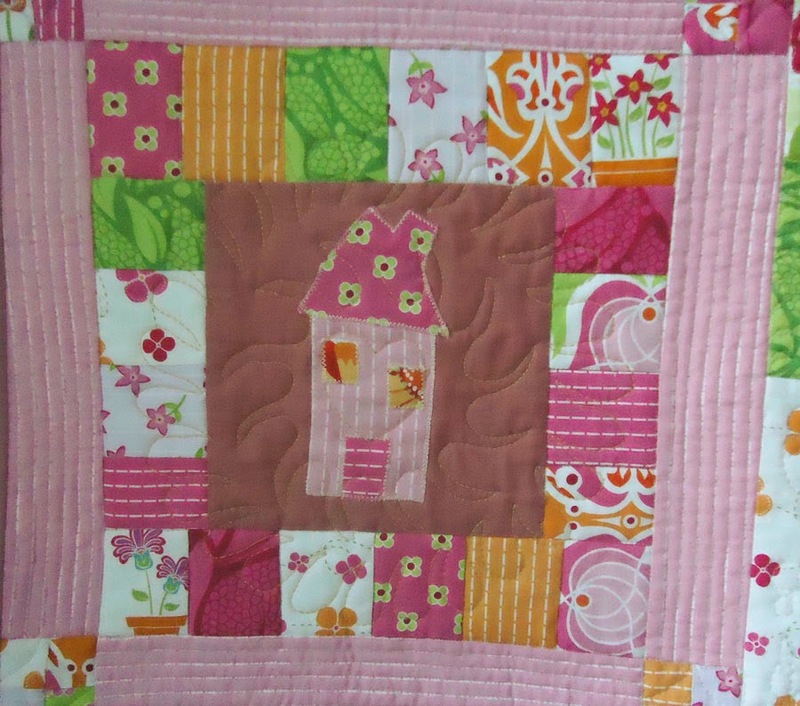 One of Cindy Needham's suggestions is to have parts of the motif outside of an area to give it depth. It's hard to see in the image, but the flower is peeking out of the border. In the right bottom part of the quilt, I practiced some of the patterns that Cindy showed us - the "S" curve, the lines and the circles. 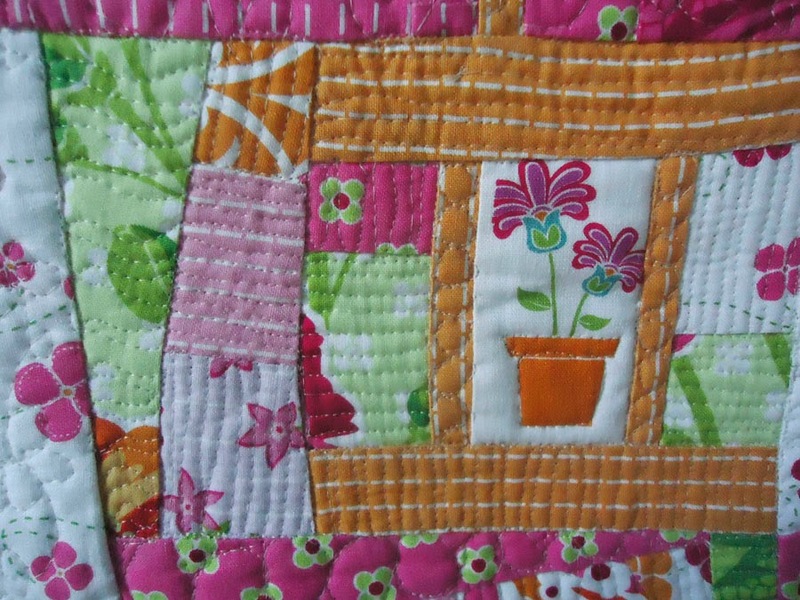 Once I was finished quilting, I added beads to the flowers. It's slow work but very peaceful. A project gets completed when it's ready to be completed - it's pretty hard to rush inspiration. On a busy quilt, you need something for the eyes to rest on. I love using templates and my stash is slowly getting bigger! Using Bottom Line thread both in the bobbin and on top for FMQ can be very effective. Quilters aren't greedy, they’re just materialistic.